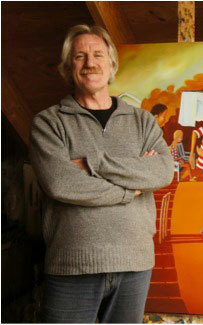 William Linford’s passion for painting began in the 1970’s. 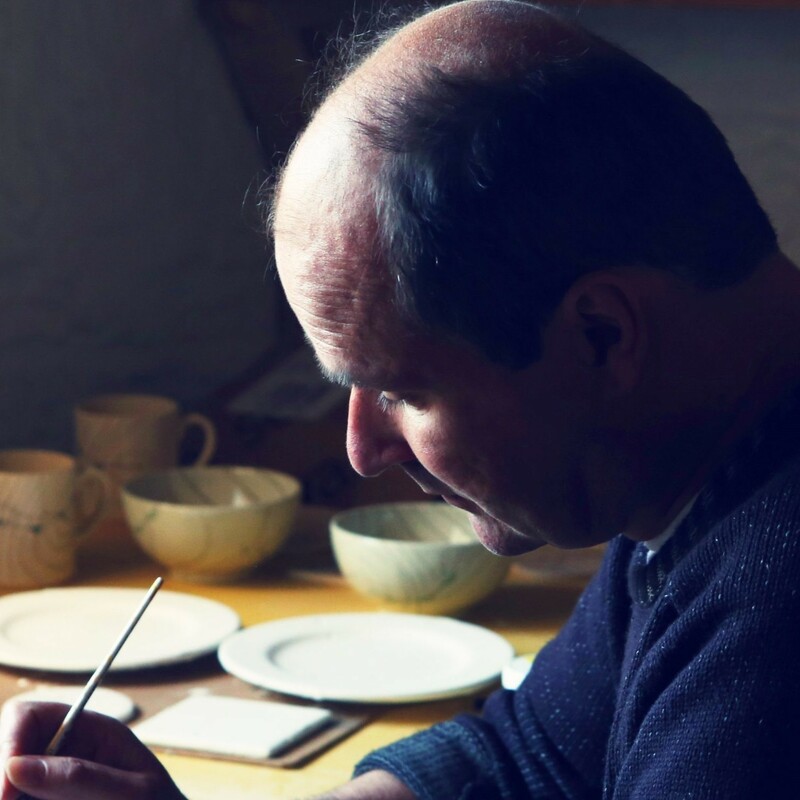 What began as a hobby has now become a full-time occupation. His work is bright and bold and incorporates a love of changing skylines. William strategically employs repetition in much of his work. 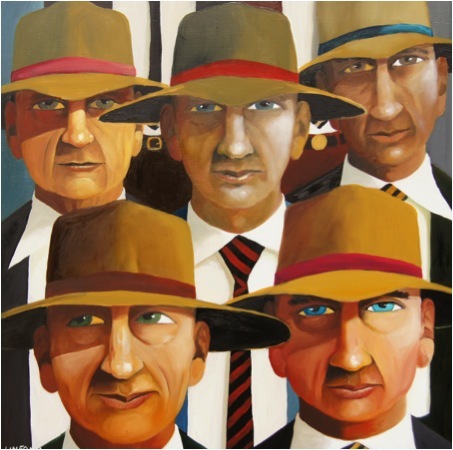 He also often embeds the ‘larrikin’ image of the Australian male in many of his paintings. William’s settings include various cricket venues, the beach, rural Australia and the circus. His success has been recognised by numerous awards and his works can be found throughout Australia and in International collections. As a boy you grew up in rural Australia. You are still keeping this image alive today. Can you discuss ‘Mum Gets a Bat’ in this context? I come from a large family in a country town. All sports were a prominent part of our lives as we grew up. Games of all sorts were played but ‘backyard cricket’ dominated much of our spare time over the long hot summer months. 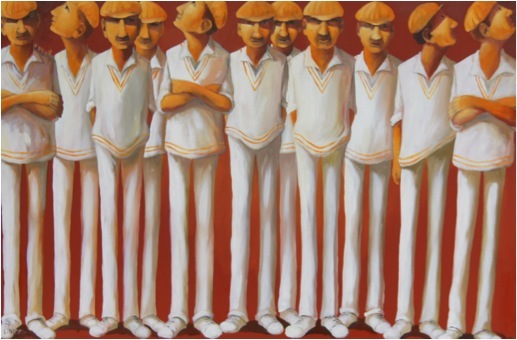 The warm hues of this painting help represent the heat which was sometimes quite stifling during our cricket sessions. Everyone in the family participated in these events, including Mum..
Cricket plays a huge part in your work. Can you expand on the importance of the sport in your work? Cricket is an extremely popular spectator sport in Australia. At first glance spectators will often comment that it contains little action. 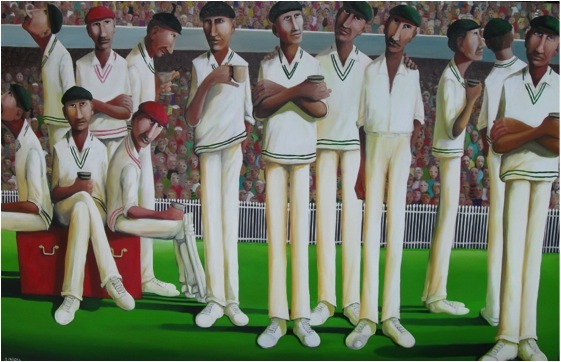 My cricket paintings could also be misinterpreted in this way however I believe that much can be read into each one. I have always been fascinated by the mix of colour that makes up the backdrops of cricket settings. I love the contrasts of cricket whites against lush green pitches and colourful crowds. 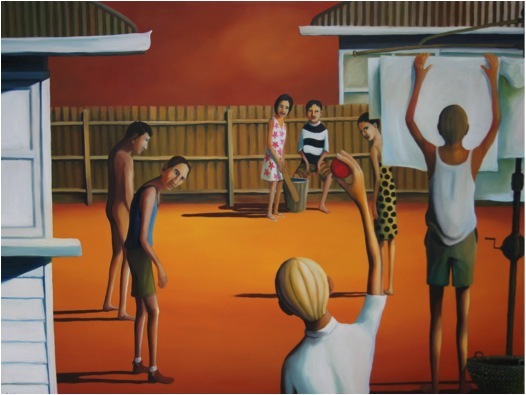 My cricket paintings are reflective of Australian beach, backyard and park culture. That elongated figure – how did it evolve? 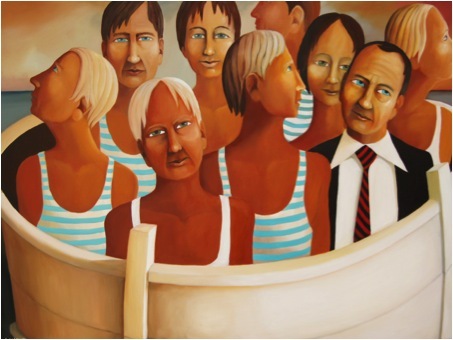 The works of famous Australian artists such as Russell Drysdale and John Brack have always appealed to me so perhaps at some subliminal level I have been influenced by their techniques. However, my elongated figures were never intended to mirror these styles; they have just become part of my evolution as an artist. Hats are part of sunny Australia. Can you expand on the use of them in your work? Not only do you paint sport but you add to it the importance of team. Discuss this? 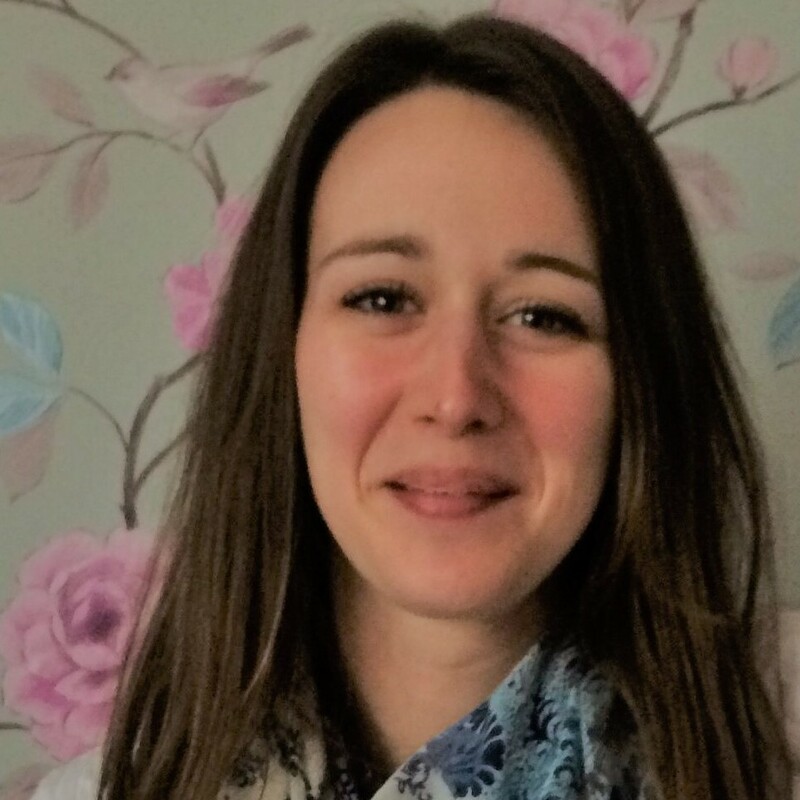 Each team member operates as part of the whole but I aim for my paintings to reflect individuals that stand out from the crowd in a variety of ways. When you study paintings such as ‘2nd Eleven’, ‘Saleyard’ and ‘Nippers’ you will notice many similarities between each character but you will also be struck by the idea that each has a unique story to tell. You have been living on the coast for over 20 years. Can you explain both the importance of Surf Life Saving and its role in you painting? The Surf Life Saving movement is an iconic thread in the Australian societal fabric. I have a great appreciation for the volunteer work that they do along the coast. I am incredibly grateful that my family has been able to live in such a beautiful coastal region. I hope that my paintings reflect my admiration for this ever changing environment and for the people who protect the coast and its visitors. 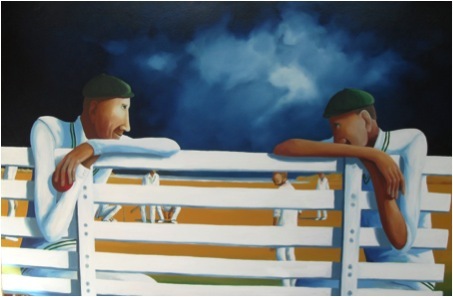 Many paintings display mateship, discuss? Mateship in Australia is often linked to the shared experiences of returned war veterans and sporting teams. I have enjoyed the camaraderie that comes from being a team member that shares experiences and laughs with others. I hope that my sense of fun and larrikin humour permeates through my work to the observer. Discuss your circus paintings and where the inspiration for this series came from? The colour and constant action of the circus has always appealed to me. In recent years I have also utilised circus themes to reflect my thoughts surrounding contemporary political scenarios. Everyone loves to know about an artist’s studio: tell us about your studio, your storage space and the time you spend in this space? Large, north facing windows flood my studio space with light at all times of the year. 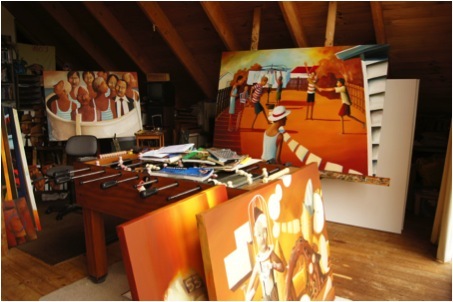 At first glance this space may appear to be a chaotic collection of canvasses, pallets, photos, books and memorabilia. At any one time I will be working at three easels with several other paintings at various stages drying against the studio wall. Although I have experimented with other mediums I seldom use anything but oils. Most days I spend six hours painting. I can easily become lost to the task and very seldom suffer from painter’s block. I feel incredibly lucky to have found a pursuit that gives me so much pleasure. You often exhibit in group exibitions. Can you discuss the way you deal with this? I enjoy solo as well as group exhibitions. It is very rewarding to exchange conversations with like-minded artists and to have the opportunity to appreciate the work of others. 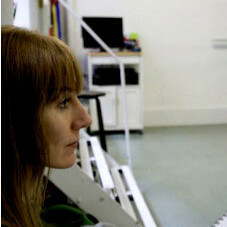 Group exhibitions encourage a wide range of people who have eclectic tastes in art. 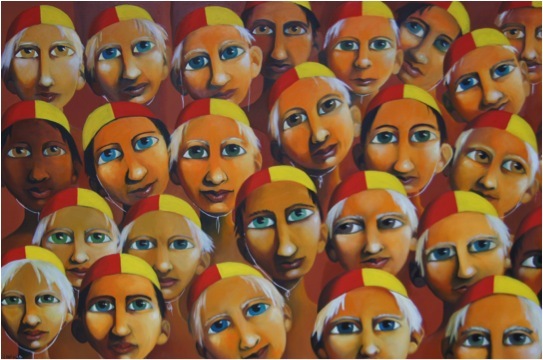 I enjoy being able to challenge traditional attitudes to painting and to bring my work to a diverse audience. Your work has been sold around the world. Can you explain one or two sales that have meant a great deal to you? I was quite excited the first time I was contacted by an International collector. Having first seen my work in a magazine and then researching my website, the Hong Kong based business person subsequently purchased two large pieces. Not only did this give me a great sense of pride but also a boost to my confidence. The second most memorable International sale was when the CEO of a large International company acquired two of my paintings when he and his family were relocating to Denmark. He selected my work as he felt that they represented the Australian way of life and would act as a reminder of home. Think a colleague or friend could benefit from this interview? Knowledge is one of the biggest assets in any business. So why not forward this on to your friends and colleagues so they too can start taking advantage of the insightful information the artist has given? 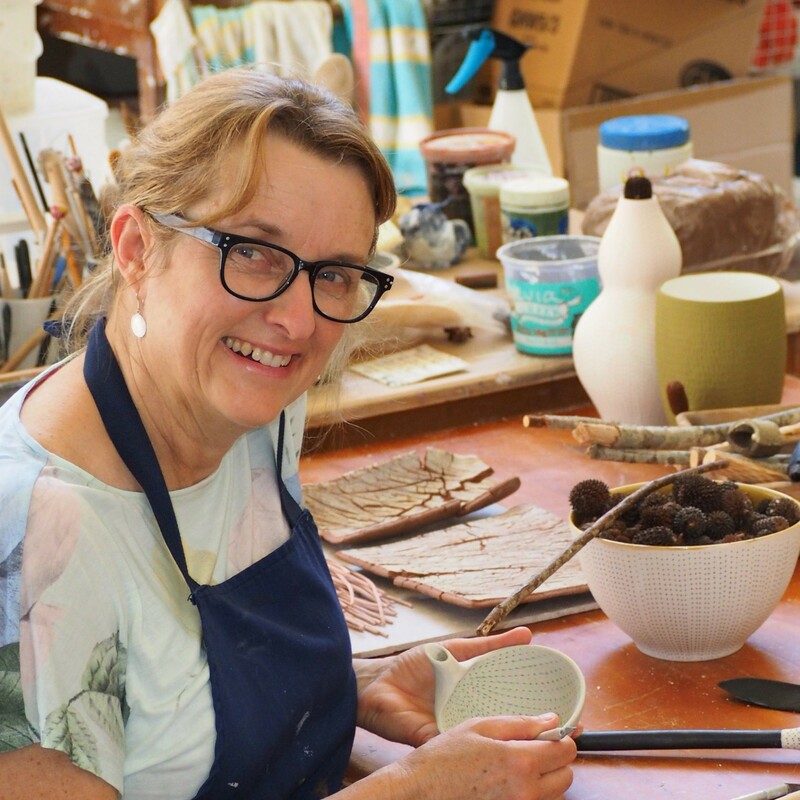 Zoneone Arts’ mission is to provide online interviews that showcase the full range of contemporary arts and crafts happening in Australia and the world. Our focus will be cross-genre to inspire, attract and influence designers and artisans. 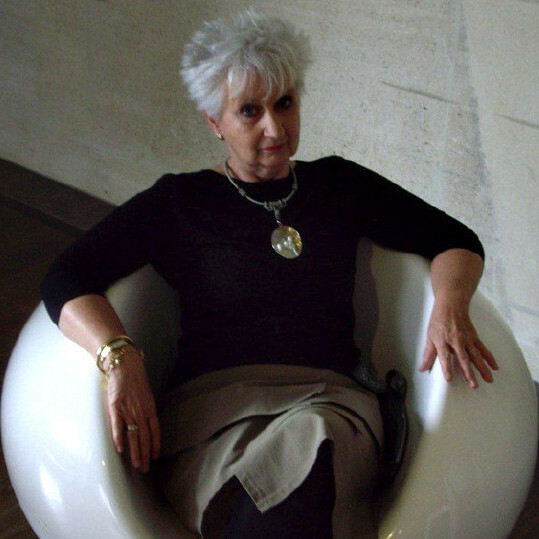 As its major feature, Zoneone Arts’ very own Deborah Blakeley interviews prominent individuals in the Arts and Creative industry.